Pattyn, S.R. (Ed.) 1978: "Ebola Virus Hemorrhagic Fever." Amsterdam: Elsevier/North-Holland Biomedical Press. Elliott, L.H., Kiley, M.P. & McCormick, J.B. 1985: Descriptive analysis of Ebola virus proteins. Virology, 147: 169—176. Volchkov, V.E., Blinov, V.M. & Netesov, S.V. 1992: The envelope glycoprotein of Ebola virus contains an immunosuppressive-like domain similar to oncogenic retroviruses. FEBS Lett., 305: 181–184. Sanchez, A., Kiley, M.P., Holloway, B.P. & Auperin, D.D. 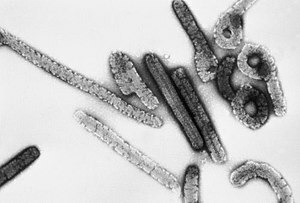 1993: Sequence analysis of the Ebola virus genome: organization, genetic elements, and comparison with the genome of Marburg virus. Virus Res., 29: 215–240. Feldmann, H. & Klenk, H.-D. 1996: Filoviruses: Marburg and Ebola. In: "Advances in Virus Research," Vol 47 (Maramorosch, K., Murphy, F. A., and Shatkin, A. J., Eds.). San Diego: Academic Press; San Diego, pp. 1-52. FILOVIR. (scientific resources for research on filoviruses). This page was last edited on 9 March 2019, at 06:50.